Camo sweatshirt, $22.99 + prime shipping || available in 3 colors, wearing color “army green”, size medium, runs tts. I’ve had my eye on this camo sweatshirt for awhile and am so glad I finally pulled the trigger! This is the #1 best selling sweatshirt for women on Amazon! It’s soft and comfy and a really good length. This top would be great with jeans or paired with leggings; great for every day. Black one shoulder tunic top, $15.69 + prime shipping || available in 3 colors, wearing a medium, runs tts. OK, so while I love the fabric and think this is a really high quality top, very soft and comfortable, I absolutely hate the sleeves. I didn’t realize that the sleeves were a different fabric! So bizarre– they’re like a very fitted ribbed material and I just think it looks so awkward and weird! I hate the way the sleeve poofs out at the elbow… but if you’re not bothered by the sleeve thing, you’ll love this top. 3-pack yoga tanks, $23.99 + prime shipping || available in single packs or in 3-packs. Wearing a size medium, runs tts. You could even size up, really. These high quality, easy tanks are great for working out or for a casual athleisure look. I can’t recommend them enough! I was really impressed with how nice they were and how luxe they feel. Plus, you can’t beat the price! White cami, $18.90 + prime shipping || typically available in 2 colors, (looks like it’s sold out!) runs tts or on the smaller side, but don’t size up too much. I ordered a large but wish I had gotten a medium! Love this cami, it’s nice quality and feels comparable to my Topshop cami or the Express Barcelona cami that everyone swears by. It’s double lined so you can NOT see through it and the cut and fit is really flattering and pretty! It’s a bit of a longer silhouette which means you can tuck it in or wear it with leggings if you need a little more coverage. The second they restock this baby, you need to make sure you get one! This is a really great wardrobe staple that works with pretty much everything in your closet. This is the thing I was most excited to get this month! You know how much I love leopard and a graphic leopard even more so. This neutral cardigan is just such a fun pop of print and is so easy to throw on over a cami and jeans. It’s pretty lightweight, so you’ll be able to use it long into the spring. 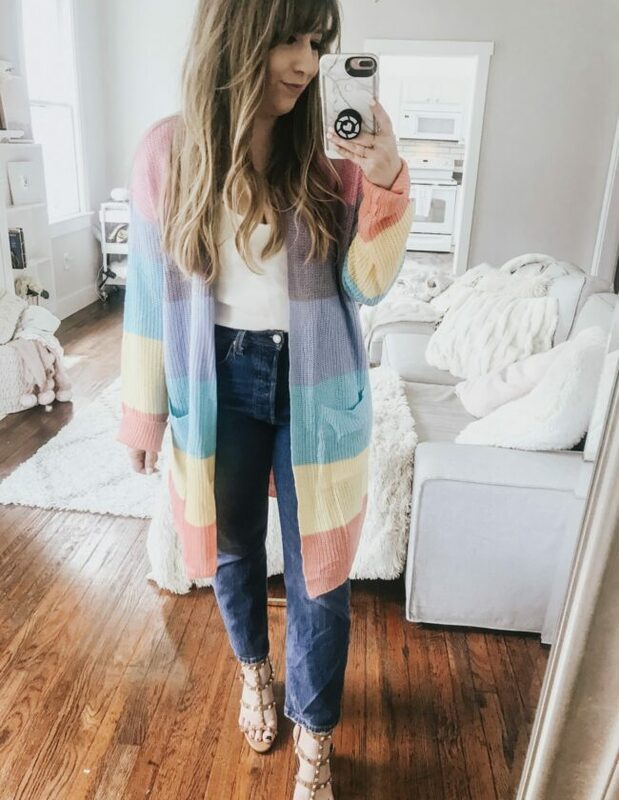 This is the #1 best selling cardigan on Amazon! Houndstooth skirt, $15.99 + prime shipping || available in 7 colors, wearing color “gray” and size large. Runs on the smaller side, size up for sure. This is my first foray into ordering bottoms from Amazon. I’m typically very cautious because I carry most of my weight in my bottom half, so skirts and pants can be a little trickier for me. I prefer to try bottoms on in-store, so I am typically very reluctant to order bottoms online, sight unseen, especially if I’m not familiar with the brand. (It took me years to order bottoms from Shein!) But, I’m glad I gave this skirt a chance! I love the paperbag waist and the pretty yet professional houndstooth print. The skirt feels feminine yet professional and I really am crazy for the print. In terms of sizing, size up for sure. It runs small and the buttons are functional… whenever you have a button front skirt, you always need to account for gaping! I ordered these a few months ago and they didn’t make it in time for my haul… so I ended up sharing them with you on Stories and then never ended up including them in a haul at all! Figured it was high time I did so! At the time I purchased them, I was pretty excited because they seemed to be an exact dupe of the Goodnight Macaroon boots that ring up for $168! (These babies are only $56!) I made observations based on photos but I finally ended up actually getting a pair of the Goodnight Macaroon boots for Christmas and now I can make a full on comparison! I think I’m going to do a full on blog post soon comparing the two, but in the meantime, know this: they’re a great over the knee boot for a fraction of the price and I think they’re a really amazing buy! Run true to size, so go with your usual size. Leopard swing dress, $22.99 + prime shipping || wearing a size medium, runs tts. I’m a really big fan of swing dresses, I love that they’re easy and comfortable and typically very cute and flattering. I gravitated towards this one after seeing it online, and think it’s cute but the cut isn’t 100% what I expected. It’s a little boxier than I thought, which is fine, but it looks different than the Amazon photo, that’s for sure. The material is very soft and stretchy, the print is very nice. 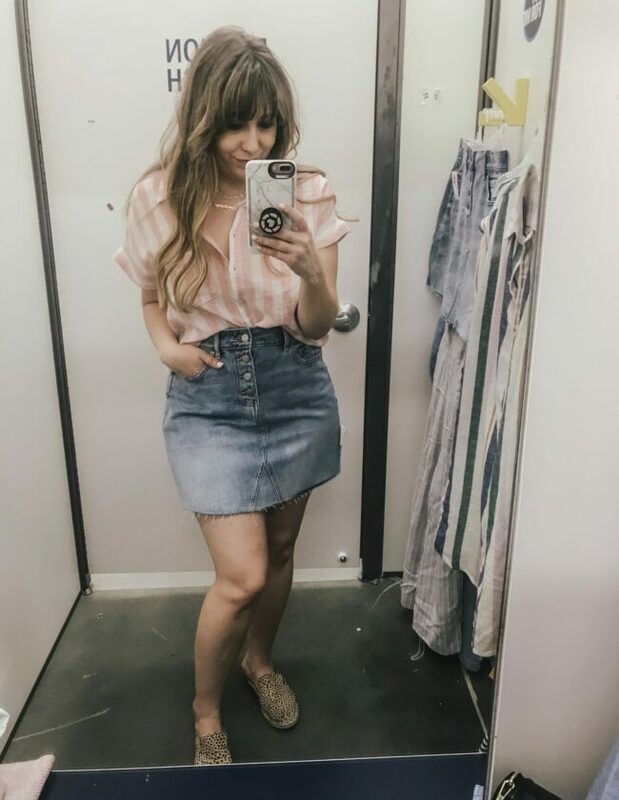 You can dress this up with otk boots like I did here, or pair it with sneakers and a jean jacket for a more casual vibe! White lace brami, $9.99 + prime shipping || available in 4 colors, runs tts to small, I am wearing a large. I love this little bralette/cami! I spotted it online and thought that for $10, it was a total steal! I think the lace is nice quality and I love how it looks paired with high waisted jeans and a cardigan! If you’re feeling a little shy, you can layer it under a tee or sweater. Thanks so much for reading! I hope you loved this month’s Amazon haul!! 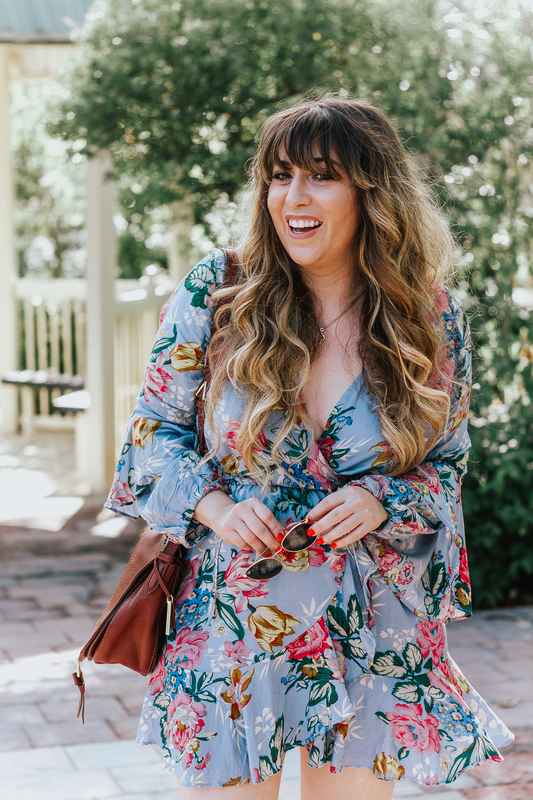 I think I found some really great pieces that will get a ton of wear in your wardrobe. 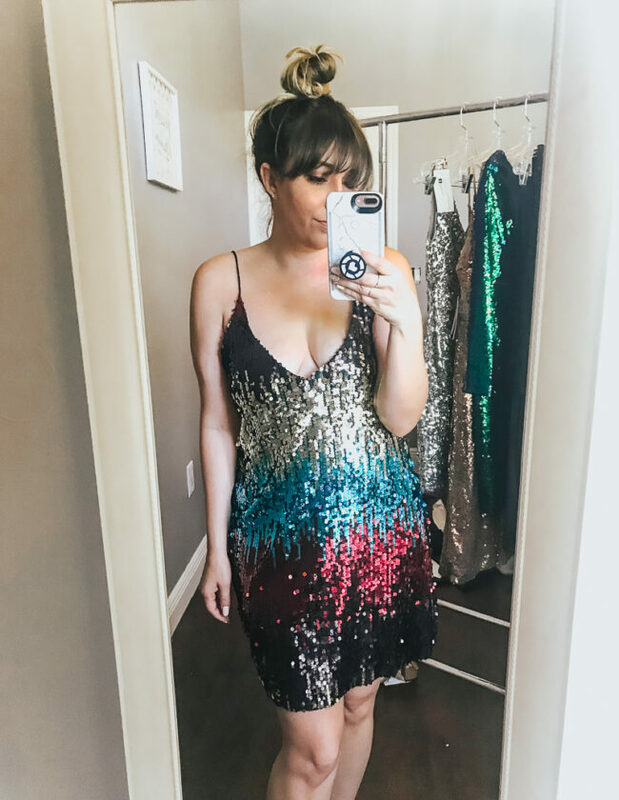 I’d love to know what you think, so hit the comments and share your thoughts on your fave pieces, what you’ve ordered from Amazon and loved, and if you’ve ordered any of my recommendations!